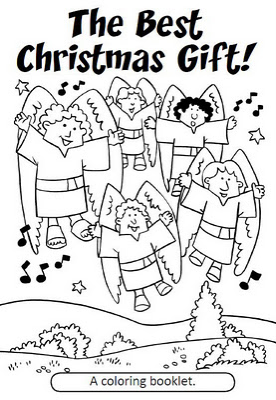 Lynette's Photo Art: Fabulous Free Christmas Coloring Book!!! This is a CAN'T MISS gift from Didier Martin, the man who gives us all those fantastic free paper models of the nativity, the resurrection, Bethlehem and so much more. He's made an adorable 8 page book of the true Christmas story. It's available in tract form or coloring book size and is currently available in English, Spanish & French. He's looking for people to translate it further for him to reach the most people. I printed mine at Staples for only 13 cents a sheet and it took only 2 sheets to print the tract size. I used them in Bible class yesterday as I knew I'd have from 3 yrs. to 6th grade or so and we were having our church Christmas party after service, so there would be more children. I read them two Bible accounts of our Lord's birth as they colored and now they each have a book of their own with the story of the Best Christmas Gift ever! Thank you Didier and God bless you again!!!! Be sure to pop by and grab the file and look around while you are there at all the wonderful resources he is offering. Be sure to "follow" him so you don't miss anything in the future.